This is a tremendous time of transmutation. All of the prior elements are coming together for a final burst of creative output. You have seen a clear view of your own needs and the posture of significant others. Now the accumulation of that input is leading to a deep, core change within you. In this phase, you will naturally be inclined to seek higher guidance so that you can emerge from this transformation successfully. 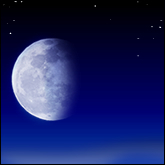 This Moon Phase favors sharing what you have learned (and are learning) with others.